Poor air quality apparently affects the running times of women in marathons, according to a study by Virginia Tech civil and environmental engineer Linsey Marr. Marr's findings come from a comprehensive study that evaluated marathon race results, weather data, and air pollutant concentrations in seven marathons over a period of eight to 28 years. The top three male and female finishing times were compared with the course record and contrasted with air pollutant levels, taking high temperatures that were detrimental to performance into consideration. Higher levels of particles in the air were associated with slower running times for women, while men were not significantly affected, Marr said. The difference may be due to the smaller size of women's tracheas, which makes it easier for certain particles to deposit there and possibly to cause irritation. "Although pollution levels in these marathons rarely exceeded national standards for air quality, performance was still affected," Marr said. Her work, done in collaboration with Matthew Ely, an exercise physiologist at the U.S. Army Research Institute of Environmental Medicine, appears in the official journal of the American College of Sports Medicine, Medicine and Science in Sports & Exercise. 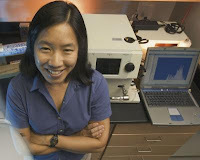 Her studies were conducted where major U.S. marathons are located, such as New York, Boston, and Los Angeles, where pollution tends to be highest. Although the person might not be significantly impacted by low-yet-still-acceptable air quality, marathoners are atypical because of their breathing patterns, she said. "Previous research has shown that during a race, marathon runners inhale and exhale about the same volume of air as a sedentary person would over the course of two full days," Marr said. "Therefore, runners are exposed to much greater amounts of pollutants than under typical breathing conditions." Particulate matter appeared to be the only performance-altering factor in air quality, with carbon monoxide, ozone, nitrogen dioxide and sulfur dioxide levels not impacting race times.